We’ve been as busy as ever at Hellbound Media, kicking off the 2017 con season in style and meeting some awesome comic fans, film fanatics and cosplayers cross the country. You can follow our adventures on our Facebook page at www.facebook.com/hellboundmedia for all the latest news and updates. The big news now is the return of our popular horror anthology series Shock Value with a fourth stand alone volume, “Shock Value: Giallo” that takes its inspirations from Italian horror and cult cinema. The book has 8 days left to go on Kickstarter where it has hit its first Stretch Goal – backing now can land you some exclusive Hellbound Media goodies as well as having yourself immortalised in print in the Special Thanks wall. Click the image below to check out the campaign, please share and support! Our next big convention of the year will be UKHorrorCon in Rotherham / Sheffield, with some amazing horror guests in attendance. We’ll also be at Cardiff Independent Comic Expo, Thought Bubble Leeds and MCM London! A full list of the years cons will be on our Facebook and this site shortly. Hellbound Media have had an amazing 2016, our best year yet and the perfect celebration of over 5 years in the small press scene. We couldn’t have done it without the support and help of our contributors, others in the small press business and, of course, those who pick up and enjoy our comics! A huge thanks to everyone. We’ve been visiting numerous comic cons this year, with next weekend seeing us in the Comic Village at MCM Birmingham, with a small but special Wigan Comic Con rounding us off in December. Check our Facebook for the Cosplay Galleries, and we will endeavour to share some of our favourites on this blog going forward. The final blood-soaked issue of “Slaughterhouse Farm” is being lettered, for release this November, following a successful kickstarter to help cover the printing costs. We aim to make further use of funding platforms as a form of pre-order on our titles, allowing Hellbounders to obtain great rewards, and support us. As push to produce stronger, and more polished titles, costs go up and this is one way we can bring you the very best work possible. Following a hugely successful year of “The Mandy Book of Monsters”, “Mandy the Monster Hunter” will be returning early 2017 with her first epic adventure, “The Face in the Curtain”. This isn’t all as there’s some exciting news for Mandy fans which we’ll be sharing soon. Next year will see titles new and old, as the”Shock Value” anthology series returns, and a new “Dawn After Dark” graphic novel follows up the successful “Kiss Me Deadly”. Thanks again for all your support, and we hope to see you at a Comic Con soon! Our newest title, ‘Shock Value presents… The Disease’ is coming soon thanks to the generous Kickstarter community, and below you’ll find a list of everyone who helped make it happen. Thanks everyone! 2016 at Hellbound Media… so far! A brief update following a hugely busy start to 2016 for Hellbound Media. We’ve just finished a potentially mind-draining run of three conventions in a row, visiting Cardiff Film & Comic Con, MCM Liverpool and MCM Birmingham. We’ve had an amazing time and met many superb people! A huge thank you to everyone who picked up a book from us, and to those who shared their awesome Cosplays with us. Our Cosplay Gallery can be found on our Facebook page. We’ll be updating again shortly, to let you know the next cons we will be visiting this year as well as news about our next new, exciting title, a horrific horror one-shot, and Hellbound Media’s first full-colour title! Mandy the Monster Hunter – THANKS! As many of you will be aware this November we have launched our long-awaited follow-up to “Mandy and the Monster”, our best-selling title. 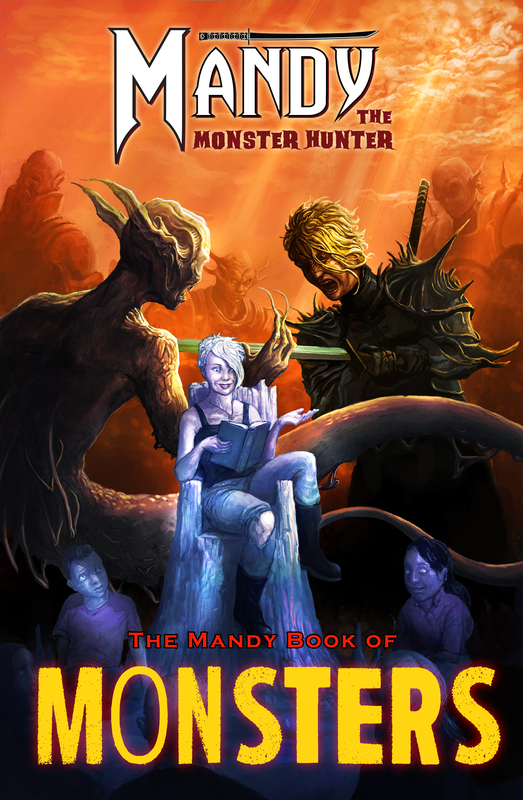 Branded under the “Mandy the Monster Hunter” name, we’ve released “The Mandy Book of Monsters” thanks to YOUR support, on kickstarter and beyond! The title will be appearing on our web store very soon. This title has kept us busy and we’re delighted to finally have it released – and with more Mandy already on its way! Anyway, without further delay, a huge thanks to everyone who supported us!